I tried to make a little graphic to illustrate this, but they all ended up too linear and/or inflexible (should content go inside the mode? are mode and content equal partners added together, with meaning overarching? or should meaning be at the end of an arrow? ) so I gave up. A boxes and arrows graphic is obviously not the most apt mode for this content and the meaning I’ve created for it. Maybe a song? When I started this course I believed I would have an upper hand in relating to the material, having a background in English language and literature. While reading Walter Ong’s Orality and Literacy I quickly realized that was not to be the case at all. I struggled with Ong’s “wordiness” and his blatant bias around the supremacy of print culture over oral culture and yet, when I began reading Jay David Bolter’s Writing Space the metaphorical light came on. Through the two course texts, supporting documents, and most of all, through some incredible discussion forums I am coming away with a much clearer idea of the significance new technologies and how they impact the way we communicate with one another, understand each other (or don’t), and the way we define our culture. While I would not go so far as McLuhan to say that the “medium is the message” I certainly believe that the means by which we afford communication impact what we say, how we say it, how it is interpreted by others, and even how we preserve our cultural identity. I have found the journey from orality to print culture to digital culture to be a fascinating one. While our class attempt to formulate a wiki on the characteristics of the three types was not as robust as I’m sure instructors had hoped for, Tim’s creation of a visual map linking ideas in the course has seemed to help bring the similarities and differences between the three to life in a really great way. (Thanks again Tim). I like Bolter’s idea that the digital age or the “late age of print” is creating opportunities much like that of oral cultures. I would not say that our current state of communication tools have come full circle and created a “secondary oral culture” but I would say that the new digital technologies diversify and remediate some of the finer points of oral culture and print culture. Simply being able to choose a technology that best supports your communication needs – whether it be asynchronous or synchronous, visual or oral or aural, or all three…creates more dynamic, truer to life, opportunities to communicate our ideas in meaningful, robust ways. But at the same time, I still believe the value of the printed word will never full be absorbed by digital media. For many of the characteristics of print are just as valuable now as they were in the day of Gutenberg’s press. Sometimes I do want to experience a work, alone, independent of the author/designer; not all experiences need to be experienced collectively. Until we cease to be individuals I think the book is safe from obsolescence. I could go on and on but this is supposed to be a final thought…although I know I will be thinking about the information I gained from this course as I finish off my MET courses, design online courses, work with youth in my classroom, read books, watch movies, listen to podcasts, work collaboratively face-to-face and in the digital realm, so thanks to you all for such an incredible three months of learning! Like my thoughts on remediation earlier on, I have been wrestling with what to say here to sum things up / make connections. I’ve known the essence of what I want to say for a while, but with others’ great, and interactive final posts, I was feeling a bit inadequate. Well, it’s time to get off the pot, as some would say around here. This course worked in a very literal sense… or… it followed in its own footsteps. The ideas of classmates, readings, and instructors have woven themselves together in a fabric… a textile… a texture… a, well… grand text, the pieces of which can’t be separated from one another. 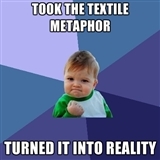 I was surprised by course’s end how much the idea of textile / fabric really ended up being a symbol for the whole course – for me, anyway. So, other than my – literally cheeky – meme above, I leave you with another unique form of texts colliding or remediating – the literal video version of an 80’s classic. For your information, this was also the first “literal video” that started them all, made by Dustin McLean in 2008. In this post, I’m going to summarize the topics we covered in the course, going by module and referring to other posts on this blog. We started off by explaining what the terms text and technology meant to us. Kym Francis defines text as a variety of communication media that are perceived by reading or viewing. I would add “feeling” to include braille and to represent all forms of perception by those with developmental disabilities. Kym goes on to say that technology consists of any tool that is used in the creative process for making text. We continued the module by discussing the costs and benefits of new technologies on literacy and education in general. In the past, pencils were seen as a threat to learning, and more recently smart phones were too. They are not fully accepted in schools, but the opportunities they provide in terms of mobile learning certainly make them appealing educational tools. Who knows what will be the next threat-turned-necessity in education? In the second module, we discussed the changes that occur when a society goes from speech-based to text-based communication. According to the class orality is characterized by rote learning, the use of memory aids, and a sense of community because the audience and speaker interact. Orality is also considered as being “in the moment” since stories change with time to be understood by contemporary society. In contrast, literate cultures are considered somewhat inflexible since printed documents may still have an impact on society when their contents are no longer relevant. Literacy is said to help sharpen analysis by allowing for a great amount of material to be studied at a time, rather than relying on the brain’s working memory, which is of very limited capacity. Kyle Stooshnov described an interesting time in London when society was in the middle of the transition from being illiterate to literate and it was possible to learn both from books and plays. Cultural activities may have been more valued back then than today since they provided not only entertainment, but also educational value. In module 3, we saw that text evolved from the papyrus scroll to the codex to the modern book. This evolution is decribed in great detail by The Electronic Labyrinth. Cecilia Sun commented on Bolter’s (2001) take on modern literacy by describing the relationship of culture and technology over time. Society’s desire for knowledge is a driving force for the development of technology and texts in formats of increasingly higher quality. As text-related technology improves, people find new ways of writing and thinking. Sheila demonstrated the impact of text by focusing on the printing press and its impact on the unprecedented growth in knowledge sharing among the scientific community. What could better facilitate communication and learning among scientists of the Renaissance than the rapid distribution of multiple copies of books… besides acceptance of their findings by the Church? Having seen, in the previous modules, how changes in technology affect society and literacy, it was now time to move on to digital texts. We discussed word processing, multimodal learning and hypertext, among other topics.We created a definition of digital literacy, indicating the communication options it provides, such as real-time chat discussions and bulletin boards. We also pointed out that digital texts consist of rich content in a variety of formats forcing changes in literacy pedagogy. Digital literacy education would have to nurture the development of critical thinking so that students appropriately use information found on the Web. Ken Stackhouse commented on this very topic by indicating that ever-changing technologies are really just providing extensions of existing methods of communication. He also addressed the need to teach multiliteracy skills using situated practice so that students can become more aware of and more engaged in current events. This module concluded with reading two chapters from Bolter (2001). He discussed the relationship between writing and the mind. New technologies provide access to vast amounts of information and increasingly complex ways of processing it. Further, they allow people from around the world to create new realities together and shape their ways of thinking when participating in communal online activities. Bolter also discussed how technology changes the way people create and organize information. In turn, the values, power structures and knowledge of society change. Acknowledging the power of technology will be important for dealing with inevitable changes in access to information in the future. My final project focused on graphic novels, and for this assignment I chose to tell a story using Comic Life 2. I have never used it before, but it was remarkably easy to create a story. The story I chose to tell focuses on an Edmonton and Athabasca-based animal rescue association, SCARS. Through a little bit of fate, I ran into a SCARS foster ‘parent’ last year, and the very special dog she was currently fostering. I tried for what seemed like forever (but was actually only a week) to find someone who could give the dog a home. So, I did. What seemed like an impulsive decision at the time has turned out to be the best decision I have ever made. Since then I have become a huge supporter of the work that SCARS does. Hopefully our story helps SCARS find a few more fans. I have learned one of the drawbacks to Comic Life is that the final product is too large of a file to upload to our UBC platforms. So, I am trying to be creative in a solution and I have uploaded it to youtube. I know it loses some of the interactivity and reading freedom when someone else is dictating the pace of your reading, but my head is about to explode out of frustration. Sorry about that, folks. The blog in this course provides an interesting timeline of understanding. A way to know in what ways we’ve changed over this short period of time. The first posts I made were rather nerve wracking as others have stated. For me, the unknown of making my first “masters” posting. How good is a master, anyway? I recall being overwhelmed and frustrated by my online, futuristic course. I wondered why I was enrolled in two separate LMS at the same school. Why I was required to log in more than once to access blogs, wikis, Connect, Vista. How was I supposed to understand the future of education when stuck in an outdated system? Working through the course put me at ease. It’s tough (pointless?) to stay on top of every kind of technology when even online dictionaries can’t keep up with modern language. I feel uncomfortable using the word text as I once did but, fortunately, the definition of technology didn’t change much. There are simply too many technologies to keep track of, let alone literacies and they just seem to keep piling on top of each other. My technologic snobbery (technophilia?) has somewhat been reduced giving me a broader view of what technology encompasses and the potential dangers of technologic bias. All in all, a vast difference from my original idea when I glanced at the course name and predicted I’d be learning about e-textbooks. Throughout the course my focus has been upon the impact that the evolution of text has had upon my work, my world, and myself. In looking at the development within the realm of text, however, I have not simply gathered information about how text has changed, but have gained tools to evaluate what these tools might do. Early on in the course I, like others, struggled to see how the information might connect to my educational practice or to the use of technology. Once I began to consider writing itself as a technology, however, the connections began to appear. Whether it was realizing that the stylus I use with my iPad is designed to look like a pen or that my students’ online discussions are dynamic because the tools they use allow them to be, my thinking shifted to understanding that text becoming hypertext has done more than change the medium of writing. Although I gained many useful tools for bringing these changes to my classroom, more importantly I gained means to consider whether or not it is in my students’ best interest to do so. Yes, the number of tools available to educators is growing daily, but there needs to be conversation about why they ought to be used (or not used, in some cases), rather than simply remediation. The fact that an approach or tool is new is not enough to make it worthwhile. 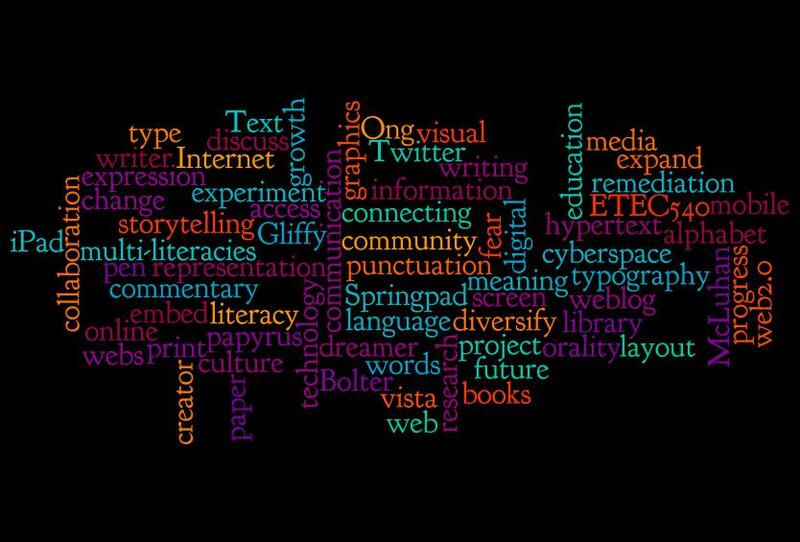 The wordle above is my way of connecting the text from the course that was most significant to me. Although they are isolated words and terms, the ways in which they combine to create a single text is, to me, very representative of the course as a whole. We began with fragmented ideas and conversations about isolated aspects of text, yet now we are discussing interactions, meaning making, and the best tools to enhance our use of text. The works of Bolter and Ong definitely stood out as key contributors throughout the course, though through the filter of our discussions, without which I do not feel as though the meaning gained would be as significant. Without thought behind and within it, text is much more limited in its ability to empower. Once that text becomes ‘active’, through hypertext, conversation, an engaged reader, or the intent to learn, it becomes powerful. Given this, the most significant text of all throughout this course has been the dynamic and ever evolving text of the course discussions. Although this text did not exist at the outset of the course, it was the most significant and valuable for me on a daily basis. The active nature of our common text created something that was always reflective of our thoughts, questions, and interests and within which we could expand the other texts into something much more. In other words, the most valuable connections within this course have been the ones between the learners. Whether it was the link between two individuals or the connection one person felt with a certain text, these dynamic links were the ones that brought significance to the experience and the information. I thoroughly enjoyed “Writing Space” by Jay Bolter and definitely found this to be a useful resource for this topic. In chapter 10 Bolter talks about turning to electronic technologies of writing in order to define cultural relationships. He then refers to Sherry Turkle in his article. I watched a Sherry Turkle video for the first time last semester and was really connected to what she said (if you have not seen the video I have posted the link below). The most useful assignment/discussion in my opinion was the rip.mix.feed discussion and it was amazing to be introduced to even more web 2.0 tools that I had never heard of before. I also thought the commentaries were really great assignments. It was nice to be able to take the lead in choosing the article that most interested us and it was fascinating to see how people interpreted the same and/or different articles from their own points of view. One of the last things I would like to comment on is the use of the Weblog for this course. This was my first time using a blog in the MET program and I thought it was a great resource and something that I wish more courses used. It was so nice to be able to read other people’s assignments and by tagging key words and the specific assignment area we were posting in kept the space well organized. I was fascinated by many peoples research projects as well as many commentaries and major projects. I really appreciated the opportunity to see other people’s work and to see things from a different perspective! Thanks again for a great term and good luck in everyone in their future endeavors!